Order your Sheaffer 300 Lacquer Blue Fountain Pen today from FahrneysPens.com. Fine Pens, Refills & Luxurious Gifts – great prices & fast shipping. Make a big impression with every creative endeavor. The Sheaffer® 300 is ultra-contemporary with a broad stance, wide polished center band and a perforated clip featuring the Sheaffer White Dot®. Representing Sheaffer’s Heritage Collection, the Sheaffer 300 welcomes sharp new finishes to its classic, masculine product line. The contemporary finish in a popular glossy lacquer finish with chrome plated trim was designed to appeal to the Sheaffer brand loyalist who appreciates quality accessories at an attainable price point. 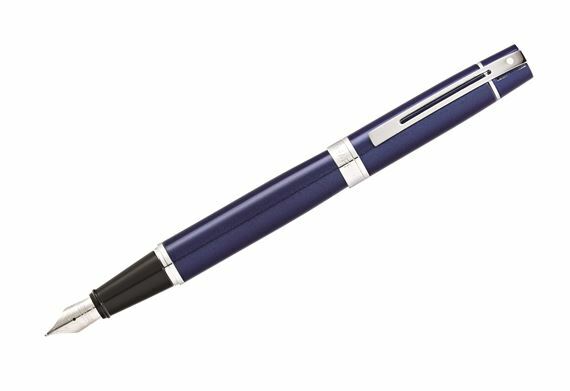 The 300 is available in a fountain pen, rollerball and twist ball pen.